I was invited to speak at the 30th Regional Seminar on Fiscal Policy, hosted by the Economic Commission for Latin America and the Caribbean (ECLAC) at its headquarters in Santiago, Chile on March 26-27. This year’s seminar focused on the role of fiscal policy in achieving more inclusive and equitable economic growth to meet the 2030 agenda of Sustainable Development Goals (SDGs). It was supported by the International Monetary Fund, the World Bank, the Inter-American Development Bank, and the Organization for Economic Co-operation and Development. Participants included ministers, deputy ministers as well as officials from ministries of Finance and Economy from the region. There was notable concern among participants regarding the recent reduction in public investment in the region and insufficient mobilization of domestic resources, reflecting weaknesses in tax policy design and revenue administration. I spoke on both days of the seminar on two topics: “Digitalization and Public Finances,” and “The Political Economy of Fiscal Policy.” An abridged presentation on the former topic is available here. In the second presentation, I highlighted the deep interconnection between politics and budgets—a fact that was well-recognized by renowned economist Joseph Schumpeter. As elections approach, governments expand spending programs or reduce taxes to improve their chances of getting reelected. This is reflected in higher budget deficits (that is, expenditures exceed revenues by more than they would otherwise). 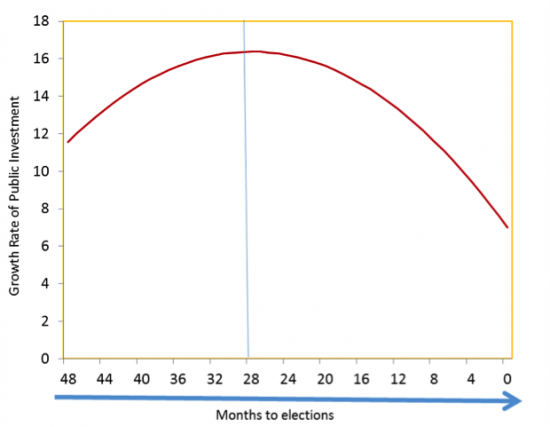 The growth rate of public investment is also affected by the electoral cycle; it is larger at the beginning of the mandate, peaking at about 28 months before elections (see Figure 1). Political divisions can take different forms: a government can be divided because of a thin parliamentary majority, a high degree of cabinet fragmentation, or a strong opposition. A politically divided government is unable to deliver on its budget promises. 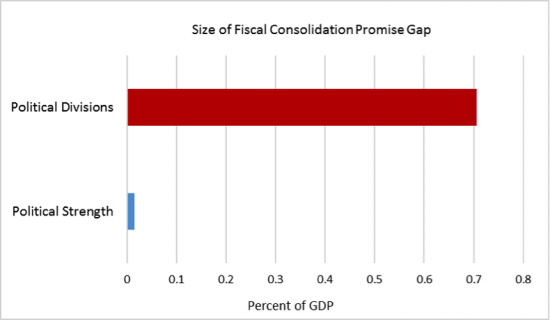 For example, the gap between planned fiscal deficit and actual results can be seven times larger in divided governments than in governments with sizeable parliamentary majority (see Figure 2). Source: Data from Gaspar, Gupta and Mulas-Granados (2017), Fiscal Politics, Washington DC: International Monetary Fund. Chapter 5. Source: Data from Gaspar, Gupta, and Mulas-Granados (2017), Fiscal Politics, Washington DC: International Monetary Fund. Chapter 2. It seems that ideology (whether a government is of left or right-wing orientation) does not affect debt or deficit levels, but matters for the composition of taxes and spending. 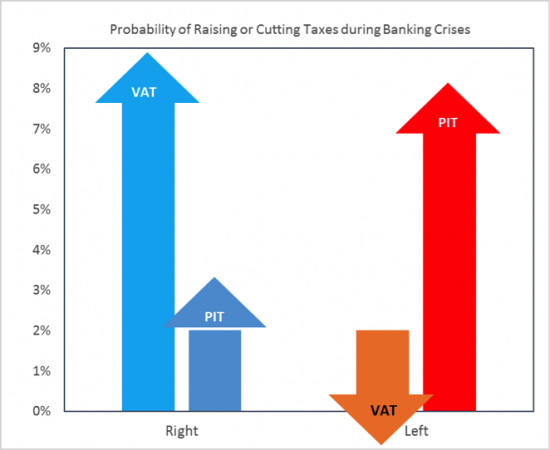 A right-wing government is more likely to increase the VAT than a left government at the time of banking crisis, while a left government is more likely to increase the top personal income tax rate. Left-wing cabinets are positively and strongly associated with larger investment booms. Source: Data from Gaspar, Gupta and Mulas-Granados (2017), Fiscal Politics, Washington DC: International Monetary Fund. Chapter 4. So, are fiscal rules and institutions capable of softening the impact of politics? The answer is a qualified “yes.” Evidence presented in our book (Gaspar, Gupta, and Mulas-Granados 2017) shows that some types of rules reduce the volatility of expenditure associated with elections. And countries with independent fiscal councils seem to have a positive influence on fiscal discipline.